President of Russia Vladimir Putin: I would like to thank the President of Azerbaijan for the idea of holding such summits and thank my Iranian colleague for organising the second summit of the leaders of Azerbaijan, Iran and Russia. I believe such regular meetings in this format are very much in demand. They make it possible to coordinate positions on the most acute issues on the regional and international agenda, conduct a constructive search for solutions to shared problems in the sphere of security and the fight against terrorism, and promote trade, economic, cultural and humanitarian cooperation. The main areas of trilateral cooperation are reflected in the Joint Statement that we will sign following today’s summit. I would like to point out several things I consider important. No doubt, ensuring regional stability and security is one of our principal tasks. It is necessary to improve coordination of the activity of [our] intelligence and law enforcement agencies, establish an intensive data exchange on the activity of international terrorist and extremist organisations, fight drug trafficking and transnational crime, and stop the attempts to transit militants via our countries. It is important to continue dialogue on Caspian problems – our colleagues just talked about that – and finish the work on the Convention on the Legal Status of the Caspian Sea as soon as possible. Needless to say, special priority should be given to promoting mutually beneficial trade and economic cooperation. Last year, Russian-Iranian trade was up 70 percent; in the [first] eight months of this year, Russia’s trade with Azerbaijan increased by 62 percent; Azerbaijani-Iranian trade is also marked by stable positive trends. In order to further stimulate trilateral exports and imports, it is necessary to streamline customs procedures and eliminate the existing barriers to the free movement of goods and services. We could also consider increasing the share of national currencies in mutual financial settlements, fostering closer ties between financial and banking institutions and getting business communities in the three countries more actively involved [in these processes]. Transport infrastructure offers good opportunities for developing cooperation. I am referring primarily to the initiative of building the western section of the North-South international corridor – our colleagues just talked about that – which is indeed one of the shortest and potentially the most commercially competitive transit routes from South Asia to Europe. We support Iran’s plans to begin the construction of the last section of the western Caspian route – the Rasht-Astara railway line. The implementation of this project will make it possible to organise transit more effective and reduce delivery costs. We see good prospects for deepening energy cooperation. Russia, Iran and Azerbaijan are firmly entrenched in leading positions in the world in terms of hydrocarbons production. I believe that joint prospecting and development of oil and gas deposits and the launching of joint projects in energy production and transit are in our common interests. Building the Russia-Azerbaijan-Iran energy bridge, integrating our countries’ electric energy systems, remains a priority. Putting this initiative into practice would help enhance energy security of the entire region and ensure reliable energy supplies. Among other much-needed areas I will single out cooperation in such areas as industry, agriculture, high technology, medicine and drug production. Positive examples of such cooperation have already been mentioned. Considerable attention should be given to cultural cooperation, the implementation of joint cultural programmes, expanding tourism and youth exchanges and sport contacts and promoting the expansion of direct regional ties between the three countries. Colleagues, I would like to express my confidence that cooperation between Russia, Azerbaijan and Iran will continue to develop steadily, acquiring a systemic and regular nature. In closing, I would like to invite you to attend the next trilateral summit in Russia. “The three countries aim to build closer ties and take advantage of the capacities of the three countries on the path to economic development and the interests of the nations of Iran, Russia and the Republic of Azerbaijan”. “The summit of the Presidents of Iran, Russia and Azerbaijan is based on the friendship and neighbourhood of the three countries, and this friendship, closeness and geographical and cultural affinity, has made us more determined to make better use of the capacities of the three countries”. “Within the framework of this transit route, we will connect north to south, and our decision is to connect Bandar Abbas to Helsinki, connecting Asia to Europe and our route is through Azerbaijan, Russia and Eastern and Northern Europe”. the president added, saying that the three countries on the Caspian Sea coast should use this sea as a sea of peace for the countries of the region and also the sea of development to use the capacities of coastal development. “Iran, Russia and Azerbaijan, with huge reserves of oil and gas and the good position in the region and the world, should have their own technological cooperation for the production and extraction of oil and gas in this region as well as joint investments in energy and other fields”. “Our electricity needs to be connected so that we can use electricity of the three countries at different times”. The third meeting of the presidents of Iran, Russia and Azerbaijan will be hosted by Moscow next year, the president added. “Closer relations and the role of the three countries in the stability and security of the region, in particular the fight against terrorism, were discussed at the meeting”. “It is important for Iran and Russia to cooperate in the establishment of stability and security, and in the fight against terrorism, especially in Syria, and the tripartite cooperation of Iran, Turkey and Russia, which is being pursued in Astana,” he continued. “At the summit, all three countries emphasised regional cooperation for regional peace and stability and the fight against terrorism, drugs and organized crime”. “Relations between the three countries are being successfully pursued and we expect a good future for this cooperation”. “I am confident that these cordial and transparent meetings will bring important results and benefits for our nations”. “Our cooperation with Iran, especially in the Syrian issue, is very fruitful, and through our cooperation with Iran and Turkey, the fight against terrorism in Syria is going well”. Thank you for republishing the article from https://candobetter.net/node/5322 (as also linked to above). 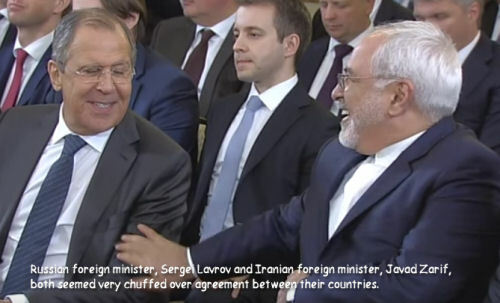 If the author is right, these agreements will make it possible for Iran and Russian to defend themselves much more effectively from further acts of aggression like in Iraq, Afghanistan, Libya, Syria, Yemen and Ukraine - and worse. We have also linked back to this page. If all genuinely alternative web sites, such as ours, were to link to each other, there would be little that the dark forces, who control Google, Facebook, YouTube, Twitter, etc., could do to prevent most people from learning the truth and seeing through the lying Corporate media narratives. Just possibly, this will help bring about real regime-change in the United States, Canada, Britain, Ukraine, Spain, Italy, France, Japan, Australia, Ireland, Greece, Germany, Sweden, etc., and peace will break out all over the world. On another matter: Whilst it may not seem to be obviously relevant to the current wars against Syria, Yemen, Iraq, Libya, Ukraine, etc. you may find of interest, on the centenary of the Russian Revolution, "Buried history: How the spread of the Russian Revolution to Germany could have stopped Hitler" at https://candobetter.net/node/5323 .